We are extremely proud to work closely with these athletes and Canada Snowboard in a variety of sport science disciplines. We are looking forward to seeing them take on the world in PyeongChang in February! Breckenridge, CO, USA – Canadian riders put on a show at Breckenridge, Colorado’s Dew Tour, with Spencer O’Brien (Courtenay, BC) and Max Parrot (Bromont, QC) taking top spot on the podium in Women’s and Men’s slopestyle respectively. Attending his 7th Dew Tour, this is the first time that Parrot has taken home the gold. Jamie Anderson (2nd, USA) and Enni Rukajarvi (3rd, FIN) rounded out the women’s podium with Chris Corning (2nd, USA) and Mons Røisland (3rd, NOR) rounding out the men’s podium. O’Brien dropped second last after taking home the number two spot during Wednesday’s women’s slope qualifiers. In the final she landed a technical and consistent run on her second go through, that the judges rewarded with a whopping 95.00 points. O’Brien was clearly excited to have stomped her run, and was estatic with her final result. Parrot also posted the highest score of the day on his second run, beating out a heavy field of riders that also included Canada’s Darcy Sharpe (6th, Comox, BC), Mark McMorris (8th, Regina, SK) and Tyler Nicholson (10th, North Bay, ON). Dropping a heavy list of tricks on the Slopestlye course, Parrot grabbed a near perfect 97.00 points on his way to victory and was clearly happy to nab the title that had eluded him up until this point. “I’m really proud of myself and happy becuse the Dew Tour has alway been a big contest for me next to the X Games and I’ve dreamnt about winning it since I was a little kid. I’ve been trying since 2011 and I hadn’t won it, but that all changed today!” said Parrot, who was quick to credit the level of riding of the other competitiors and the comment on the difficulty of the course. 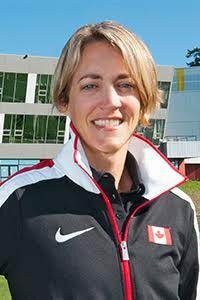 Laurie Blouin (Stoneham, QC) was the next best Canadian female finisher with an 8th place. At Friday’s Dew Tour Adaptive Banked Slalom, John Leslie (Arnprior, ON) and Michelle Salt (Calgary, AB) finished in 4th, with Curt Minard (Vernon, BC) taking 5th and Alex Massie (Barrie, ON) taking 8th. Upon confirmation of WSPL point value, this represents the final eligible competition until the freestyle selection deadline of January 1st 2018. Results and nominations to the Canadian Olympic Snowboard team have not yet been officially confirmed.